How could I expect more from the Universe when I didn’t appreciate what I already had? Around four o’clock, we head out onto the Vegas strip again, starting at the hotel modeled after Venice. Hand in hand, we strolled across the bridge. 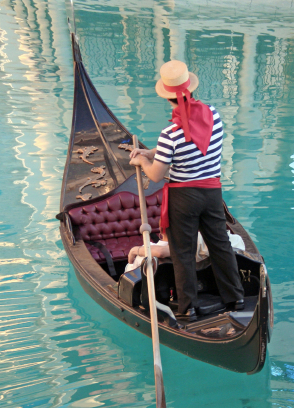 Beneath us, a mock gondolier in a red scarf and striped shirt sang in Italian as he paddled a replica gondola through replica canal waters. John stopped on the bridge and put his hand on my shoulder. We stood like this a moment, looking out over the canal. I closed my eyes and listened to the music. He looked at me but said nothing. We continued walking towards the hotel foyer and as we got closer, we saw a group of elderly tourists, staring — heads back, mouths open — at the ceiling. We followed their gaze and there, on the dome-shaped ceiling, was a magnificent painting. I gave him a mock punch on the shoulder. “You saw the Sistine Chapel right?” he asked, as we walked out the hotel doors. We continued along the strip…past a two-block long artificial lake with dancing fountains, past a half-size Eiffel Tower, past a brightly-lit castle. “There’s so much of the world to see,” said John. “I realize that,” I replied. Half a block from the New York City skyline, I snapped a photo of John with the replica Empire State Building in the background. A little further along, we stopped beneath a smaller-scale Statue of Liberty. Inside, we strolled along the replicated streets of Manhattan, past steam rising from pretend manhole covers, to a bar where a crowd of people had gathered. Since John was over six feet, he could see over most of the heads. “Oh, you’ll love this,” he said, pulling me to the side for a better view. There was a guy singing and playing a piano as the patrons gather around, humming along and having a hoot. “I wonder if this is like a real bar in Greenwich Village,” I heard myself say. “Regardless, this is pretty cool.” Now there was an edge to John’s voice. I’d smiled at John’s use of a literary reference. He wasn’t much of a reader. He was right. When we do finally begin the trek back to our own hotel, after a loop through the pyramid, our feet were aching and we were both irritable. On the way, we passed dozens of men slapping sleazy photographs of teenage prostitutes and strippers against their thighs. “There’s some authenticity for you,” John remarked. Back home in Canada ten days later, I found myself in the ICU holding John’s hand as he succumbed to brain injuries sustained from falling through an unmarked false ceiling. With my index finger, I gently traced the three little moles, all in a row, on his forearm. I held his hand and whispered in his ear, comforting him as best I could as his body shut down. It was in the operating room, where they were to remove his heart for transplant, that I bid John farewell. Then I am taken home to begin my new life as a thirty-two-year-old widow. One year later, I make it to New York. Alone. “That was only three weeks ago,” he says. On my first night, I go to Yankee Stadium where dozens of police officers stand guard outside the building. I buy a Yankees ball cap, hotdog and a beer; then watch the game in a near-empty stadium. The next morning, I walk from my hotel on Broadway to the financial district in downtown Manhattan. Past the jazz bars of Greenwich Village I stroll. But there are no crowds of cheerful patrons singing. Nor is steam rising from manhole covers. The remains at Ground Zero, however, are still smoldering. I stop in front of a flower-laden shrine to fallen police officers and firefighters. I bow my head and say a prayer for the dead, as well as a fanciful wish for the loved ones left behind: may their year ahead be less horrific than the past one has been for me. Walking north now, towards Battery Park, I see a group of Marines armed with machine guns, standing at a checkpoint. One of them stares out across the water. I turn my head to follow his gaze and there, through the barbed-wire fence, I see the real Statue of Liberty for the first time. “There she is,” I whisper. I open my eyes and turn around. The Marine who had been staring at the Statue of Liberty now stands behind me. The Empire State Building looms in the background. His hand drops to his side. I nod then begin the long walk back to my hotel, past the thousands of missing persons’ photographs flapping on telephone poles. The following afternoon, I’m sitting on a park bench in Central Park, watching the ducks in the lagoon, when a teenager sits beside me. “We’re here to spread the word of God,” he says, patting his bible. Clearly unimpressed with me, he walks off. So I wander over to the Bronx Zoo and am standing in front of the black bear enclosure, watching an old timer snoozing in the sun, when an older woman comes up to me. “He’s not too worried about world events,” she says. She tells me she’s a zoo volunteer and then fills me in on the bear’s history, personality, and daily habits. I’m inspired by her commitment. This is her tiny corner of the world and, despite all that’s happened, she takes her job seriously. I look up and it hits me: because of my struggles this past year, I am evolving. Right here on the library steps, I feel a faint stirring deep inside, as if the part of my self that fell alongside John is finally trying to get up again. I stand up, sling my backpack over my shoulder and head over to the Metropolitan Museum of Art where I find myself practically running from exhibit to exhibit…from Greece to China, Mesopotamia to Peru. In the Natural History Museum, I come across a replica of Lucy — the 3.5 million year-old hominid — I’d learned about in university. I stare in awe at her through the glass. Then I turn and race to the space exhibit at the other end of the museum, where I’d heard complimentary snacks were being offered. I down a glass of wine and a couple of meatballs then catch the Imax show narrated by Tom Hanks. I gaze up at the night sky replicated on the ceiling of the empty theatre. When I see the three little stars all in a row of the Orion Belt, I smile. In the gift store on the way out, I buy a pink dragonfly necklace and matching earrings to symbolize the year of transformation I’ve somehow made it through. My final evening in New York is spent at a sold-out performance of La Boheme at the Met. But as I listen to the beautiful Italian music, I find myself thinking about the rescue workers still searching for bodies a few blocks away. I turn to my right and see a guy about my age sitting where John — in an ideal world — should be. And then I turn my full attention to the opera because despite all that’s happened and all that still lies ahead, this is the moment I am in.